LADEE (Lunar Atmosphere and Dust Environment Explorer) will explore and characterize the moon's tenuous atmosphere. LADEE is planned for launch in 2010-2011, and will be managed by NASA's Ames Research Center with its program office at NASA's Marshall Space Flight Center (MSFC) in Alabama. LADEE is a strategic mission that will address science goals 8a and 8b from the 2007 National Research Council Study "The Scientific Context for Exploration of the Moon" to the extent that is possible within the limitations imposed by mass, cost, and duration of the proposed mission. Document the dust impactor environment (size-frequency) to help guide design engineering for the outpost and also future robotic missions. The payload data rate is approximately 10 kbps with our baseline S-band communications system. Detailed trade studies of orbital elements versus payload mass and mission length are underway now. The orbiter payload is expected to include two instruments: a dust detector and a neutral mass spectrometer. However, there may be sufficient mass to include an additional atmospheric instrument. The mass devoted to science payload (instruments) is strictly limited, and will not be allowed to grow. The tight schedule (in order to reach launch in 2010-2011) and limited budget precludes extensive instrument development for this mission. The Government is initiating several new lunar missions based on the President's Fiscal Year 2009 budget request including both orbiters and landers. These missions are lunar science missions within the overall envelope of the U.S. Space Exploration Policy. This Request for Information is directed to the first of these, a small lunar orbiter, LADEE, that will address elements of the 2007 National Research Council (NRC) Report, "Scientific Context for the Exploration of the Moon," hereafter SCEM, in particular, the lunar environment (see objectives 8a and 8b in SCEM). A small spacecraft is now under development at NASA's Ames Research Center under the direction of Dr. Butler Hine, project manager. Early estimates suggest that the spacecraft can accommodate approximately 20 kg of science instrumentation, although the precise mass of payload will depend on the launch mass available to the mission as well as on the precise lunar orbit chosen for the mission. The current spacecraft schedule requires that the science instruments be delivered to Goddard Space Flight Center for accommodation on the spacecraft by April 2010. Ultraviolet and Visible Light Spectrometer: will determine the composition of the lunar atmosphere by analyzing light signatures of materials it finds. Neutral Mass Spectrometer: will measure variations in the lunar atmosphere over multiple lunar orbits with the moon in different space environments. Lunar Dust Experiment: will collect and analyze samples of any lunar dust particles in the tenuous atmosphere. Lunar Laser Communications Demonstration: will demonstrate the use of lasers instead of radio waves to achieve broadband speeds to communicate with Earth. LADEE was originally planned to be launched as a secondary payload with NASA's GRAIL mission, but was later transferred to a dedicated Minotaur-5 launch vehicle. 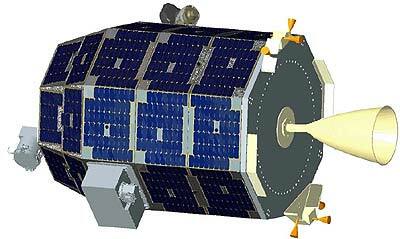 Minotaur-5 boosted the LADEE Spacecraft into a highly elliptical orbit of 200 km × 278,000 km around the Earth. Over the following 23 days, as LADEE orbited Earth 3.5 times, the Moon's gravitational field increased the perigee of its orbit. The spacecraft fired its on-board thrusters to alter its trajectory to allow it to enter orbit around the Moon. LADEE spent about 2.5 months reaching the Moon, getting into its science orbit, and checking out systems before its 100 day science mission started. The nominal science orbit is a near-circular retrograde (clockwise) equatorial orbit with a period of 113 minutes at about 50 km above the surface. The periselene (closest approach) is over the sunrise terminator. In January 2014, LADEE's mission was extended for about 4 weeks, as it retained enough fuel. After the science mission is complete, the orbiter impacted the lunar surface. The LADEE NMS instrument confirmed that the moon’s exosphere is made up of mostly helium, argon, and neon. Their relative abundance is dependent on the time of day on the moon. The instrument conducted systematic measurements of these gases for seven months, which allowed to understand how these gases are supplied to the exosphere, and how they are ultimately lost. While most of the lunar exosphere comes from the solar wind, NMS showed that some gas comes from lunar rocks. Argon-40 results from the decay of naturally occurring radioactive potassium-40, found in the rocks of all the terrestrial planets as a leftover from their formation.